J. D. Chapin became the Vice President of the company in 1913 and by 1921 he was the president. Interestingly, that was the same year the American Axe & Tool Company was acquired by the Kelly Axe Mfg. Co. In 1930 Welland Vale purchased the Bedford Mfg. Co. of Bedford, Quebec. Later that same year the whole Welland Vale Co. was purchased by the American Fork & Hoe Co. American Fork & Hoe had also purchased the Kelly Axe Mfg. Co. of Charleston, West Virginia the same year. The Bedford Mfg. Co. name was continued for at least three years before that plant was closed and their equipment relocated. 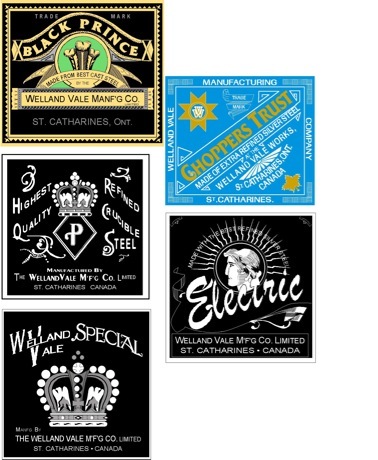 It is believed that some of the more notable brands were continued for some time by what became the Welland Vale Mfg. Co., Ltd. The American Fork & Hoe Co. kept some of the Welland Vale manufacturing facilities open for a few years until they got more organized in Canada and while they prepared to relocate some of the manufacturing equipment to a more centralized location. The company name formally became the Welland Vale Mfg. Co., Ltd. During that time the company was often referred to as Welland Vale-True Temper but many of the axes they manufactured were marked as having been made by the Kelly Axe & Tool Co. of Canada, Ltd. They were permitted to use the word “Company” in Canada whereas they had to change itto “Works” in the U.S.A. In reality the parent company was comprised of a number of other plants that operated under their own name but produced produces under multiple names. The companies included Welland Vale itself; The Bedford Mfg. Co., Inc.; The Canadian Axe & Harvest Tool Co., Ltd.; the Canadian Shovel & Tool Co., Ltd. and the Maple Leaf Harvest Tool Co., Ltd. There was also a handle manufacturing division located in Strathroy, Ontario named the Canadian Turner-Day Handle Co. There again, a similarly named company existed in the US which was owned by True Temper at the time. 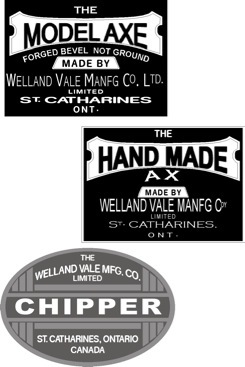 Like True Temper in the US, Welland Vale produced a range of products, mostly in the forging category. 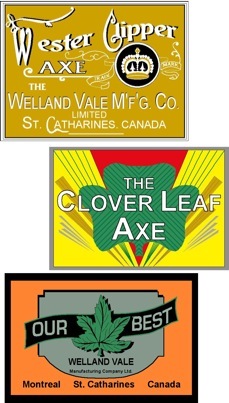 Welland Vale was known to have used numerous labels and brands and their reputation was well known across Canada. In 1965 the company officially became True Temper Canada, Ltd. and the works at St. Catharines were closed down. American Fork & Hoe Co. The primary trademark used by the Welland Vale Mf'g. Co.
Axe label depicting the company label. Etching used on some Welland Vale axes. Simplified marking of the Welland Vale trademark lion head as it appeared on some hatchet heads. Paper label used on possibly the most renowned Welland Vale axes. Other, less common paper labels used on Welland Vale axes. Some labels were quite detailed, others were rather simple. 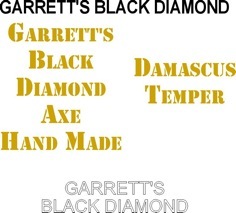 The brand that included the name GARRETT is not known to have included any graphics. It was either stamped into the axe head or stenciled on in paint. 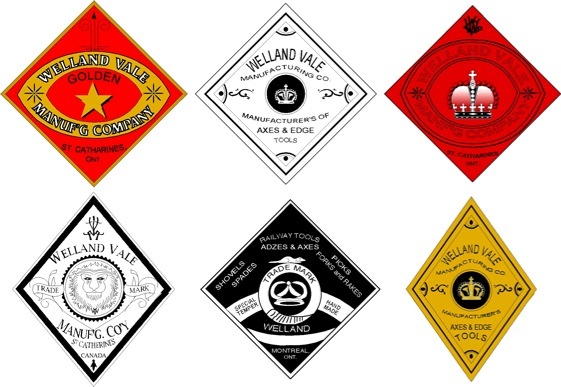 A number of the labels that Welland-Vale used were printed in such a way that the label appeared to be diamond shaped. Many of the axes that Welland Vale manufactured were marketed through distributors and wholesale hardware concerns. It appears most had the Welland Vale identification included. 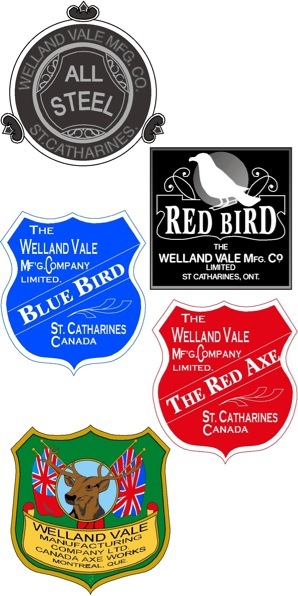 Some brands used by Welland Vale were also used by other manufacturers and distributors both in Canada an in the U.S.A. The Welland Vale Mfg. Co. also provided axes with labels that did not include their own name or location. Stamping used on some Welland Vale axes. Updated paper label used on Welland Vale axes and hatchets. Paper label believed to have been used on some hatchets made by Welland Vale . 1. The Welland Vale Mfg. Co. made some axes and hatchets for other companies located in Canada, the United States and some foreign countries. Quite often the labels used on those tools did not include a company name or they included the seller’s name as the manufacturer. This practice avoided the need to provide warrantees. In other cases only the distributor’s name was included. 2. 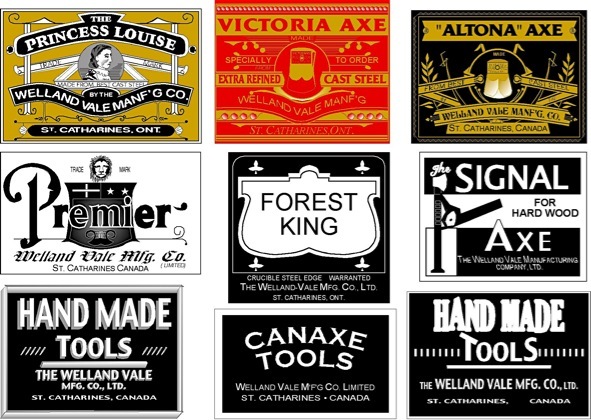 The Welland Vale name and some of the markings associated with the company were used on axes and hatchets made by the True Temper Company after they acquired the Welland Vale Mfg. Company. renamed as Welland Vale Manufacturing Co.